Listen to "Leonardo da Vinci" on your iOS and Android device. For persons interested in detailed descriptions of painting techniques, anatomy and biology, this book is for you. It is truly Astonishing how prescient he was about the way things in nature work. He was able to evaluate vortices in the tricuspid valve of the heart, detailed studies of the eddies in creeks and streams, and so on. Alfred Molina is unparalleled in his ability to voice act. I wish he would do the voiceover for every audio book! I found the book fascinating and the narration to be one of the very best I have ever heard. A really great production. Listening and learning about this most wonderful human who made such magnificent art as well as being an explorer of some much was extremely enjoyable. The book filled in many gaps I had in my own thoughts of da Vinci and allowed me to understand and enjoy his work so much better. The flow of the book was excellent. Excellent book, although it may not be for everyone. An unexpected amount of detail accounting Leonardo's complex mind and life. 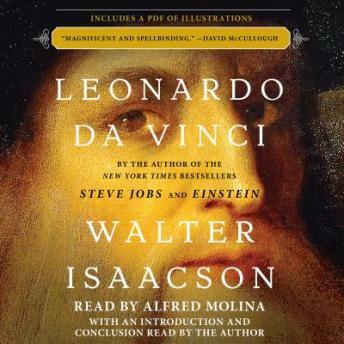 Walter Isaacson never fails to write such well documented and engaging biographies of histories most interesting geniuses. Excellent insights into the life and career of a genius who certainly had shortcomings like the rest of us and the book allowed us to look at the whole man. If you could, who would you have lunch with: living or dead? For me, just behind Jesus is DiVinci so I was excited to get my hands on this book. And, it did not disappoint. I learned things about him that made my appreciation grow even deeper. He was the original thinker on oil paint, rendering, perspective and emotion in paintings. His dissections of human bodies and the documentation of that work, enabled artists to this day to accurately and realistically depict the human figure. He also inspired military and medical innovations that still have us marveling. I listened while painting and had to stop several times to look at the illustrations (I also bought the hard copy for that reason) so I could fully appreciate the detailed explanations. As always, Isaacson's research was impeccable and the narrator was truly gifted. Isaacson ended the book with a call to action for all readers. A few of the many: 1. be relentlessly curious 2. observe 3. write notes, on paper 4. see the unseen 5. get distracted 6. respect facts 7. indulge fantasy 8. be open to mystery. Leonardo has now rightly been defined as the world's most curious person of all time. What is out there waiting for one of us to ponder and research? If you are interested in a detailed account of one of the greatest minds ever this is a book for you. Leonardo Da Vinci isn’t just the artist of the ages but a brilliant, inspiring, and intellectually inquisitive person that was so far ahead of time it is almost difficult to believe. Brilliant work depicting a brilliant man.